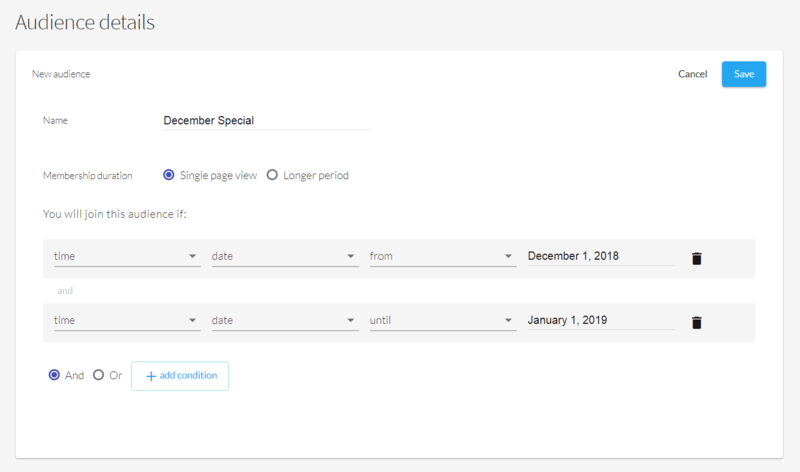 Whether it is day vs. night, Monday vs. Sunday, regular day vs. Holiday - depending on your website and business you'll notice that conversion rate can be correlated to time. With Unless, you can optimize your results by showing people different experiences based on when they visit your website. Fast delivery: Fast delivery influences 89% of all purchasing decision. You offer next-day delivery for orders placed before 6pm? Let your visitors know by dynamically changing the headline based on time. Time-based CTA: You display a phone number on your website but your team is not available 24/7? Hide the number during weekends and after office hours, and display a contact form instead. This way visitors can leave their contact information and you can call them back when you're at the office. This prevents frustration and increases leads by 20-30%. Seasonal Branding: In eCommerce, a great way to stand out to consumers is to tie branding into seasonal events. However, most business only do this for big holidays, spending months on preparation. Through personalization you can standardize the process. This allows you to create small campaigns fast and to rotate your featured products better. The webshop Lulus takes full advantage of seasonal branding, regularly rotating the inventory featured on their homepage. Note how the navigation ties into it as well, offering white dresses and prom dresses, both popular April/May options. Time Window: Select a start and end time for your audience to trigger personalizations based on time, for example an "early morning audience". Day of Week: Create an audience around a specific day of the week, for weekends, or weekdays. Date Range: Create an audience for date range to trigger personalizations on specific days or for a date range. In the example above, we created an audience for December 2018. The associated personalizations will be visible from 00:00AM, December 1 to 11:59PM, December 31.